When I heard that David Letterman was retiring after 33 years as the host of the Late Show my heart sank. I’m at the age when my generation’s cultural touchstones are beginning to retire. I was 25 years old, fit and sassy when Dave came on the air. He was picking up the torch from my parent’s icon Johnny Carson. Over the years Dave has been my companion. He was with me during grad school and moves around the country. Dave was with me when I got married and our kids were born. He’s been there during good and hard times always able to make me laugh. Over the years there have been two camps. 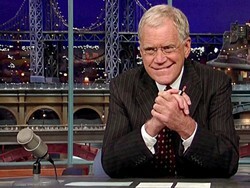 Those who watched Jay Leno and those of us who were with Dave. Jay had higher ratings and from my perspective was the safe choice. One knew where Jay was going, predictable, mildly enjoyable like music on an elevator. Dave was the un-Jay. He was the loveable curmudgeon who took you to places you’d otherwise not go. While Jay played it safe, Dave celebrated that which was weird. He was willing to take comedic risks. Sometimes it worked, sometimes it didn’t but when you tuned in you knew that Dave wasn’t phoning it in. He also had prophetic side which challenged those with power, whether it be corporate, cultural or political. Dave got mad at injustice and called it like he saw it. He knew that some things just weren’t funny. An intensely private person he could be wonderfully transparent as when he had heart surgery and brought out his medical team on stage to thank each of them. On another occasion when being threatened with blackmail for having a sexual relationship with an employee, Dave a married man with a young child, went public and admitted his mistake and was ready for the consequences. On May 20th I’ll tune in for Dave’s last show. I’m glad that Steven Colbert (a cultural touchstone for my daughter’s generation) will be taking up the mantle of the Late Show. I think he too will be willing to take risks and take us to places we’d otherwise not go.